Bimedia is a leading supplier of POS terminal solutions in France, with over 14 years’ knowledge in the tobacco-press industry. It creates innovative solutions to help convenience stores to use hardware, software, exclusive dematerialised services and professional support to sell in a more efficient way. 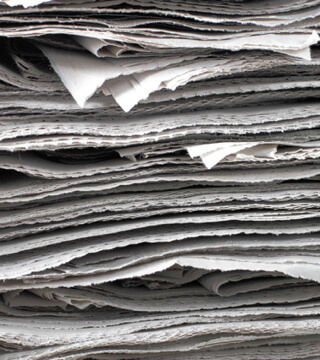 By anticipating customer needs, Bimedia makes everyday life easier for thousands of tobacconists, newspapers and booksellers across France. It prides itself in best in class innovation and customer satisfaction. 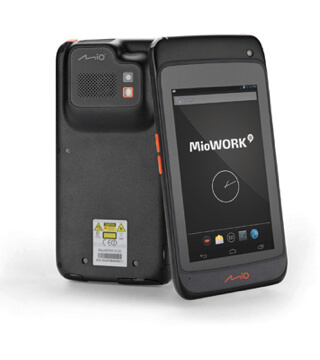 MiTAC provides customised MioWORK™ A235 rugged tablets to Bimedia. Powered by in-house Bimedia software solutions, the tablets have contributed to reducing time for customers by three hours. Improved accuracy and efficiency in stock control, inventory and sales has changed the way hundreds of store owners across France work. Bimedia had previously used devices that were not fit for purpose. They were uncomfortable to hold, difficult to use and screen size was not appropriate for their application. It was not compatible with inventory applications, unreasonably priced, unreliable, and too heavy. Newsagents and convenience store workers wanted a technology solution but were seeking more effective and efficient ways to stock check and in general keeping of their stores. Bimedia had a comprehensive review of its tablets and made the decision to look for a new hardware provider. The hardware had to include a 1D/2D barcode scanning, touch screen, a minimum 4” screen and it had to be drop-resistant. Bimedia audited several manufacturing companies and following a recommendation by an existing client, was introduced to MiTAC. A trial began with a range of products being examined on the MioWORK™ A235. With a 5.7” screen, lightweight at 370g, it was ideal as it was big enough to view products on screen but also small enough to be held. The A235 has a capacitive multi-touch panel, fit for purpose being water-resistant and drop-resistant, and high quality barcode scanning. The device runs on Android with a fast processing system. 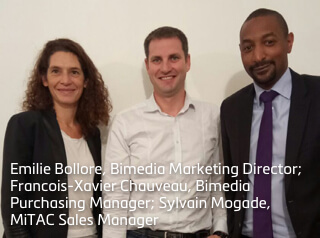 After successful development and testing, Bimedia selected the A235 tablet in 2015, rolling it out across ‘tobac-press’ businesses and supplying to store owners across France. The device is simple, easy to use and lightweight. The 5.7” HD colour LCD with the capacitive multi-touch enables workers to see the product on screen to reduce time when doing stock control and inventory. The high-quality scanning ability along with the POS system has enabled workers to scan at all angles improving work performance. The built-in Wifi enables the device to be synchronised and kept up to date at all times, particularly important in a busy store. Together, MiTAC and Bimedia have created a device that is a complete solution to help workers maximise their time and efficiency in store. This has a knock-on effect for the rest of the business and Bimedia’s customers were extremely impressed. Prior to working with MiTAC, Bimedia had only sold an average of 100 tablets per year with POS solutions. By September 2016, the partnership with MiTAC delivered over 1000 MioWORK™ A235 devices across French Newsagents and convenience stores. Bimedia is now looking forward with technology, responding to customer demands and ideas as well as trends within the tobacco industry. It has secured further business with MiTAC and will provide a more advanced solution to customers in 2017. Because of the support provided and the affordable price, MiTAC is now an integral part of Bimedia’s business and future plans, contributing to 70% of their total POS terminal sales. Collectively, the MioWORK™ A235 and Bimedia POS solutions have provided a winning formula with thousands of satisfied customers across the country. “We looked at a number of tablets manufactured from all over the world and MiTAC was the company to work with. One standout feature was that the team at MiTAC could provide us with complete customisation, allowing us to run our system. We spent a long time in testing to ensure it was a good quality product and right for our customers; I am very pleased with the customisation of the tablet adding hardware features with no huge detriment to price. Ultimately, the key factors in our decision were the price and the overall application.